Because of the wonderful weather year round, Floridians are fortunate to enjoy outdoor entertaining on patios and kitchens much of the time. They become an extension of the indoor kitchen and add character to the home. When you’re building for the first time or remodeling an out-of-date kitchen patio keep in mind the amount of exposure to the elements your kitchen will face. 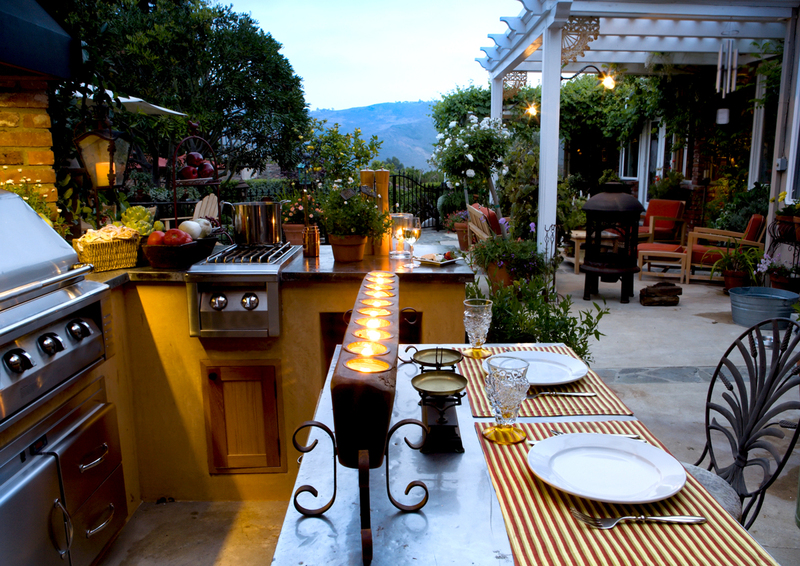 Choosing certain materials for countertops and cabinets will ensure the longevity of your new outdoor kitchen. When guests come out to the patio, you want them to feel a smooth transition from the indoor kitchen to the outside environment, not as though it were two separate homes. Keep in mind traffic patterns for moving in and out when entertaining and using both kitchens. Utilize the space given and allow the cook to still be a part of the group without isolating him or her too much. Select a theme for the room and incorporate it throughout to blend in the perfect materials. Use countertop and cabinet material that is as low-maintenance as possible, meaning it has plenty of durability when it comes to stains, scratches, and heat. Natural stone, granite, and concrete are some that are reliable. The easier it is to clean, the better as well. If you don’t mind the upkeep, materials like soapstone, tile, sealed pavers and stainless steel are also a few options that are lasting for the outdoor weather. Appropriate color palettes are important as well. Try avoiding darker shades. These may be prone to absorbing more heat and UV rays and can be harmful. Choosing colors that are from light to mid-range can be safer and not as likely to fade.